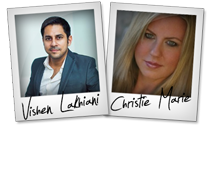 Vishen Lakhiani + Christie Marie Sheldon – Mindvalley – Unlimited Abundance 2018 Launch Affiliate Program JV Invite, More. Welcome to the JVNP 2.0 Update featuring a primary JV request courtesy of fellow JVNP 2.0 Partners Vishen Lakhiani (Mindvalley) & Christie Marie Sheldon (Unlimited Abundance 2018 launch affiliate program JV invite), Buzz Builders (Robert Kiyosaki – RichDad Summit launch), and More, in Today’s earn healthy commissions helping your audience overcome their Abundance Blocks in 2018 edition. It’s time for the annual Unlimited Abundance launch, and you don’t want to miss it. Every year, all of us come together to step into a New Year with a launch of the most successful, best-selling, and famous program of Mindvalley – Christie Marie Sheldon’s Unlimited Abundance. That’s right, our annual Unlimited Abundance launch will take place on the 3rd week of January, and you can join it by applying to Mindvalley affiliate program here. How much money would you be making TODAY if you had already overcome all your Abundance Blocks? · Abundance Blocks are the subconscious barriers that prevent you from manifesting wealth. · Discover exactly how it’s possible to remove your Abundance Blocks by using a special technique called Energy Clearing. · Here Christie gives you a simple yet eye-opening abundance calculator that you can use to instantly see how close (or far) you are to being financially healthy. UA is one of our highest converting offers, and its revenue consistently hits over $1 Million. Looking back on our last launch for UA, ave. EPC for affiliates was around the $1.20- $2.64 mark. Once again, remember to register for the Mindvalley affiliate program to receive your affiliate tools before everyone else. JV with Mr. Rich Dad Poor Dad, Himself … & Earn up to $10 for each $1 Sale! Earn up to $10 per $1 sale, PLUS 75% on upsells PLUS 50% on continuity for life promoting a household name! Robert Kiyosaki (AKA Rich Dad Poor Dad) is having a launch (with the help of Anik Singal and the Lurn Team). Don’t Miss This One! Robert Kiyosaki – RichDad Summit JV page. Proven High Ticket Product = Big Affiliate Commissions! Easy $300 Commissions Per Sale. Biggest Forex Launch of 2017. Nicola Delic’s New $997 physical product. Prelaunch: November 27th. Launch Day: December 4th 2017. Alaziac Trading has a great reputation for making affiliates tons of cash and we’re at it again. Don’t miss out on the Money! Nicola Delic – Forex Master Levels JV page. Earn up to $1,000 per Sale – Average $45 per Webinar Registrant – Lifetime Cookies – Proven Product! 5 Day Crypto Challenge launch sequence teaches the proven B.L.A.S.T method for investing in CryptoCurrencies and making average gains of 1,000%. Subscriber gains access to insider buys, weekly new picks, analysis of major digital currencies and a full-blown crypto trading education. Up To $1,000 per Sale – Average $45 per Webinar Registrant – 50% Commission – Lifetime Cookies. Cecil Robles, John Halpin + Joseph JV Varghese – Bitcoin Mentor Club JV page. Imran S, Jamie Lewis, Travis Stephenson and other fellow JVNotifyPro 2.0 partners are waiting in the wings … keep your eyes on your Inbox, and follow the action in the JVNP 2.0 Premium VIP JV Announcement archives. Posted in Joint Venture Announcements, Self Help	| Tagged Affiliate Marketing, Affiliate Program, Affiliate Program Directory, Affiliate Programs, Attract Affiliates, Attract JV Partners, Best JV Brokers, Buzz Builders, Christie Marie Sheldon, Find Affiliates, Find JV Partners, Home Business, Internet Marketing, Joint Venture Blogs, Joint Venture Forums, Joint Ventures, JV Announcements, JV Blogs, JV Forums, JV Invite, JV Launch Calendar, JV Product Launch Calendar, JVNewsWatch, JVNotifyPro, Launch, Make Money Online, Marketing, Mike Merz Sr, Mindvalley, New Product Launches, Niche Marketing, Online Business, Product Launch Calendar, RichDad Summit, Robert Kiyosaki, Unlimited Abundance 2018, Vishen Lakhiani, Work At Home	| Comments Off on Vishen Lakhiani + Christie Marie Sheldon – Mindvalley – Unlimited Abundance 2018 Launch Affiliate Program JV Invite, More.